My home-base is in the township of Richmond, close to Nelson City. From here I specialise in providing day fishing trips ex-Nelson to local rivers. The Nelson region is blessed with some great wineries and excellent restaurants and anglers can choose from a full range of accommodation options, from basic to luxurious, to meet any budget. 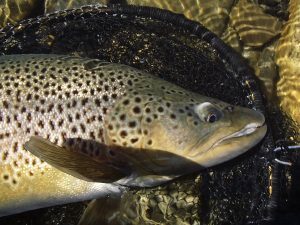 There are several first class rivers within easy driving distance that provide good day-fishing suitable for most levels of fitness, including the Motueka, Wangapeka, Buller, Wairau and Owen Rivers … plus several other smaller streams. 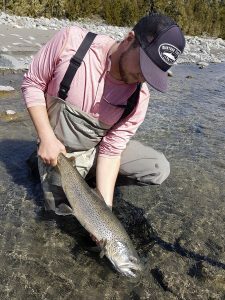 Anglers can expect to catch trout averaging between 1.0 kg to 2.5 kg most days, with larger fish to over 4.5 kgs (10 lbs) encountered from time-to-time. Travelling times to the fishing water, range from 45 mins to 1.5 hours. Typically a fishing day involves starting between 7.00 – 8.30 am, depending upon seasonal conditions. We can fish until late to suit anglers’ preferences and commitments. NB: Forward bookings must be for a minimum of 2 days or longer and require a deposit to secure. From time to time I am available to guide anglers who are seeking only a single day’s guiding … however I don’t accept forward bookings for a single day, greater than 5 days in advance of the requested date. If you are looking for a single days guiding contact me from 5 days to 24 hours in advance of the requested date … if it fits into a gap in my schedule (please refer to my Schedule of Available Dates) we’ll be good to go. Single day bookings do not require a deposit. I am very happy to meet and fish with anglers who wish to base themselves in St. Arnaud or Murchison , at a previously mutually agreed location. *** NB: I am no longer offering extended multi-day road trips away from my base in Richmond, but am happy to recommend guide friends who do offer this type of service. 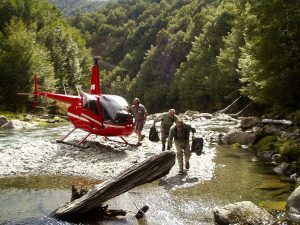 Flying by helicopter to access our remotest rivers is an exciting fishing option and a blue-ribbon New Zealand angling adventure. Helicopter access puts the angler into some absolutely spectacular scenery and beautiful fish. We fly only with top quality helicopter operators who have many thousands of hours flying in our rugged mountainous terrain, in machines that are fully maintained. The day involves an early pick-up and a short drive (15-30 mins) to the helicopter base and the fishing generally concludes at around 5.00 – 6.00pm. Please note: helicopter fees are additional to the daily guiding fee. This is an opportunity for anglers who have the energy and a love of wild places, to camp-out and maximise the value of a helicopter charter. Anglers spend one night camping out in the field in either a tent camp or a back-country hut, fishing for two days on new water each day. As with remote country hiking/fishing experiences anywhere, anglers should be aware that the weather in the New Zealand mountains is unpredictable and changeable. After heavy rain NZ rivers often rise quickly, sometimes sufficiently to halt safe progress. On occasions when it is not safe to proceed, anglers must be prepared to spend additional time ‘in the hills’. Usually our rivers fall almost as quickly as they rise. *** NB. I advise anglers planning any back-country camp-out trip to allow at least a two-day window beyond the proposed end of the trip, before scheduling international departures. *** NB: I no longer offer hiking and camping trips of longer than one night away … but am happy to recommend other guides to you for this type of experience. On all of our trips, both local river and back-country, I carry a personal locator beacon, a satellite phone and emergency equipment. For camp-outs I can provide backpacks, sleeping bags and camp equipment as required.